My rating: 9/10. Very good watch, tough and durable. Today I’m doing a Casio GA-100-1A4ER review. 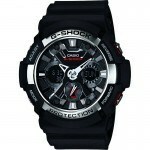 It’s not surprise to my regular readers that I highly rate Casio’s G-shock series of watches, they’re extremely durable and built to last with a focus on withstanding mechanical shock and vibration. 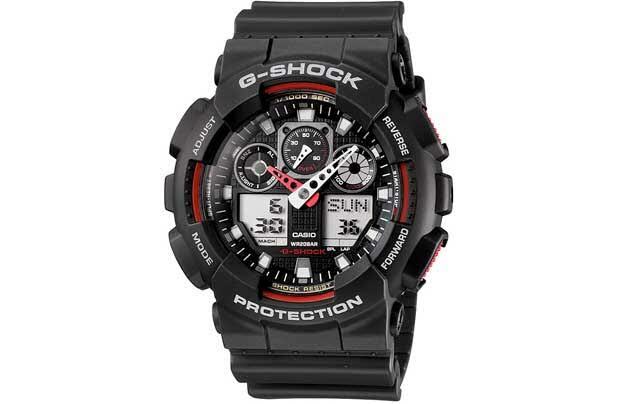 Like a lot of the other watches in the G-shock series this model has a stainless steel case that’s wrapped in a tough protective resin that gives it this oversized design, it’s also features rich with it’s perpetual calendar, stop watch, countdown timer, digital tachymeter and LED backlight. Like many of the other models this one utilises a dual analogue/digital display to show off all of the features. 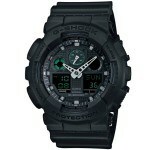 You may also like my 5 top G-shock watches for men. Band Resin strap, standard length, 28mm width, Buckle clasp. Case Stainless steel casing wrapped in protective resin, sizing diameter: 51 mm and thickness: 17 mm. Dial Duel display analogue and digital. Mineral glass offers a good level of protection from scratches and is ideal for shatter protection from dropping. The resin design offers this watch a very good level of protection making it the ideal watch for those seeking something extremely durable. 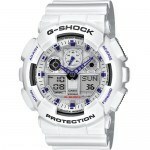 As with many G-shock watches this comes with a lot of handy features. Note that due to it’s oversized chunky design this may not be ideal for everyone. The Casio GA-100-1A4ER offers very good value for money in my opinion, it’s easy to see why so many people flock towards G-shock watches when their after a timepiece that is extra durable. Casio are a brand you can trust and the G-shock range is something I will always happily recommend to anyone seeking a longer lasting watch. Perfect for tradesmen and outdoors people alike, remember to tweet in your picture to us if you get one. Hope you enjoyed this Casio GA-100-1A4ER review. Find more watch reviews below.